Good day Everyone! What a perfect spring morning it is here today in North Carolina! Sitting on the porch in the early sun was glorious, feeling peaceful and thankful. Emma and Betsy had a good sniff around and seemed to be very interested in the first daffodil of the new year. So we took a picture. Spring feels so fresh and full of promise! What a delight and blessings to have another day to live and create! Today I am off to a painting class with Jodi Ohl right here in my home town! I am thrilled to be spending all day painting! Yahooooo! Have a beautiful creation filled day. Thank you so very much for stopping by, your comments are precious to me! Your sweet fur babies are darling and your weather looks splendid. I am from NC too and will be moving back there at the end of this year. I really miss the beautiful weather there. Oh, they are SO adorable! And how wonderful to see daffodils in flower. Here in Scotland there is not even a small sign that they are coming up and if there was, the snow would be covering it. So I'm going to imagine sharing your sunshine! They are so cute! I know ours were happy to be out walking yesterday. We still have quite a bit of snow on the ground. Awww....this picture is just the cutest! And the flower is so refreshing to see! We don't have flowers yet, but we DID see our first Colorado Bluebird this morning. A mating pair on the lookout for a home! Now THERE is a sign of Spring! Happy day to you and let us know how the painting class went...lucky YOU! no daffodils here yet - or even any shoots. But I did see snowdrops beginning to pop up. I just, well in January, bought a yorkie/cairn from fellow artist, pam warden. She's now 4 months old and has learned to pee on the paper (pad), eats her poop, ignores the command "NO!" and is generally as precious as they come! Her name is Sister Mary Tina (she's Catholic). 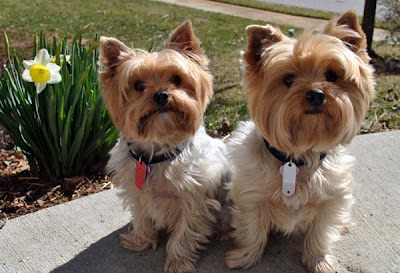 Your Yorkie's are absolutely beautiful. You can see a picture of Sister on the right bar of my blog with the other dogs and cat pics. Emma and Betsy are just too too cute. We had a glorious day of sunshine here too and the daffodils are Springing forth in bloom. Looking forward to seeing results from your class. Aren't they just SO cute! I love daffodils too...ahh..Spring is coming! Emma & Betsy are so darned sweet, oh they brought a huge smile to my face. Makes me wonder about their little personalities..SWEET!!! No flowers here, piles of snow, but it is a beautiful day!